Following all the excitement of work beginning on site in late summer, and our official foundation-laying event in October, the contractors working on our new visitor centre at Sherwood Forest have been busy getting on with the important groundworks, and making great progress, as our project manager, Ross Frazer explains. Planning is most definitely an essential part of any project, but the really interesting bit begins once you begin to see change, and things are certainly starting to take shape on site now. If we were excited about the foundations being laid for our new visitor centre, then we're positively beside ourselves now that the wooden framework is starting to go up! Despite the best efforts of the wind at the end of November, our contractors managed to secure the first of the posts in place, marking the end of groundworks, and the shape of what's to come. 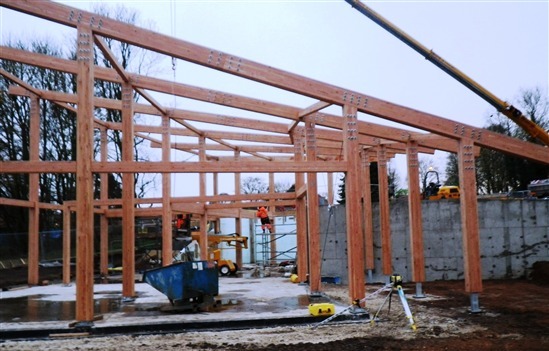 Because the glulam frame really does make up the body of the building, the next phase of the work onsite takes the build so much further on. The framework should be complete before Christmas - if the weather behaves itself! - and work can then begin on the roof. Again, visually, this will start to look so much more like the finished article. The build is at the stage where the structure looks different every day now. I know it’s exciting for everyone working on the project to see this – it makes us all feel so much closer to the day when we will be able to welcome visitors to our new centre! As part of the project, we’ve created a Sherwood Forest brand to reflect the partnership working here, and alongside that, have built a new dedicated website too. Its great to see it coming along, but I have always been put off by having to pay for the car park at Sherwood; as a local' its too expensive to pay every weekend and at other times in spring/summer, and a season ticket isn't cheap either, Now the RSPB are involved, will it be like other reserves where RSPB members do not have to pay for car parking?